For more details and to book, call into the Tobermory booking office in Ledaig car park. Runs 5th April until the 14th August. Puffin and Staffa experience – this trip departs from Tobermory and then heads across to Kilchoan on the Ardnamurchan peninsula to pick up those passengers staying on the mainland. 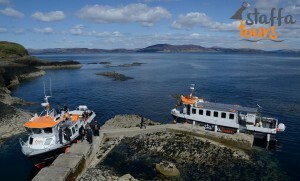 You will then head across to Treshnish looking out for marine life en route. The waters surrounding the treshnish and Mulls coastline can be one of our summer hotspots for Minke Whales and Basking Sharks and the local guide will be on hand to help you spot and identify the wildlife. The Treshnish Isles, these uninhabited islands are a summer haven for wildlife, from the nesting seabirds that return to the islands in spring to the pupping Grey Seals in the autumn. The boat will stop on Lunga the largest of these islands, where you will be able to get up, close and personal with the hundreds of breeding Puffins. These comical little birds nest in burrows in the grass hillside and are incredibly inquisitive, coming within a few metres of you. Ensure that you carry on past the Puffins and head to the far end of the island where you will come across Harp rock, which is the cliff-side nesting site for many more seabirds from the other Auk family members the Guillemot and Razorbill, Kittiwake and Shag amongst others. You will then return to Tobermory via the sea off the West coast of Mull giving you the chance to enjoy some fantastic scenery. Daily. Includes 2 hours on Lunga. this trip starts on 15th august until the 10th September, when the puffins have left the Tresnish isles, Wildlife and Fingal’s Cave – This trip will take you down to the stunning natural wonder of Fingal’s Cave on the Isle of Staffa. This cave has inspired many people including Mendelssohn to produce the Hebrides Overture. After an hour on Staffa that will give you plenty of time to explore the cave by foot you will then move on to Lunga, and after you have marvelled at the sight of so many breeding seabirds you will then return to Tobermory via Calliach point, the North West ‘corner’ of Mull. On your journey you will be on the look-out for a wealth of wildlife from Sea Eagles and Seals to Harbour Porpoise and Minke Whales. On a clear day you might even get a glance of the top of Ben More, Mull’s only Munro. Daily. Includes 1 hour on Staffa.